Anita's Crepes used to sell their crepes at Farmer's Markets until last year when Anita opened her own restaurant in Ballard. 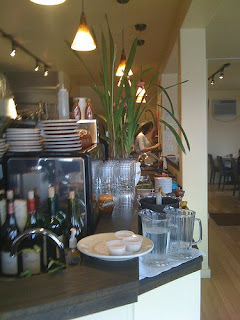 Anita turned what used to be an old vaccuum repair shop into a cozy, little French crepe bistro. The space is a vast improvement from its prior tenant. The space is now filled with little, square tables and leather chairs. 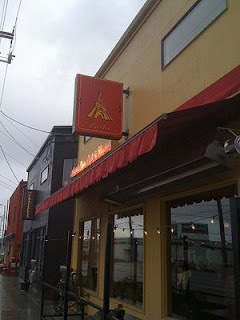 The restaurant has nice hardwood floors and an open kitchen. I really liked the simplicity of the place. 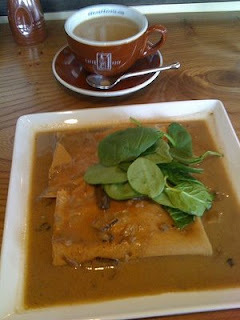 I ordered the wild mushroom and spinach crepe. The crepe had cooked spinach in the crepe and fresh spinach on top. The best part was the mushroom sauce surrounding the crepe. Whenever I eat a crepe I never think it's going to fill me up, but this crepe was very hearty and just the right amount of food for lunch. My friend ordered the Raspberry freezer jam crepe. His crepe was very tasty. It was like eating dessert. It was topped with powdered sugar and whipped cream. This crepe was also a generous portion, and was a good size for lunch. It came with eggs and sausage. Anita, the owner, was working the day I had lunch. She was great. She always has a smile on her face. You can tell her staff really enjoys working there too. They were all very nice. 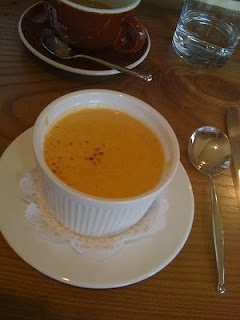 As we were finishing our lunch, one of the cooks asked us if we would like a small complimentary bowl of lobster bisque. Of course we're not going to refuse free lobster bisque, so we happily accepted. The bisque was delicious! I'd definitely come back and pay full price for it, and I will also come back to try some of the other crepes on the menu. 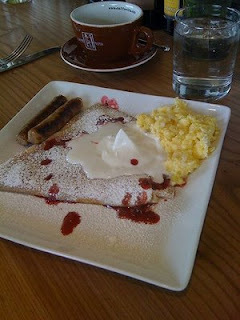 Anita's Crepes is definitely a bright spot on an otherwise dreary Leary Way in Ballard. I give Anita's Crepes 3 out of 5 crepes.